Using Microsoft Visual SourceSafe (VSS) with Microsoft Access for system development is great for tracking old versions, maintaining a professional Access development platform, and multi-developer environments. Being able to quickly see old versions of individual objects, differences over time, and check-in and check-out objects to prevent multiple developers from changing the same object are all wonderful features. Unfortunately, as Access databases get more objects, VSS slows down and can sometimes take minutes to add a new object to the database. Waiting for VSS to prompt you for every new object not only wastes time (especially if you don't want to add a temporary object to VSS), it disrupts the rhythm of system development. Fortunately, there's an easy way to work around this. Microsoft dropped support for Visual SourceSafe in Access 2013. If you are using Access 2013 or later, you can still use VSS, but you'll need to use Access 2010 to add new objects and check-in/check out existing objects. You can still use Access 2010 to develop solutions for users running Access 2010, 2013, and 2016. 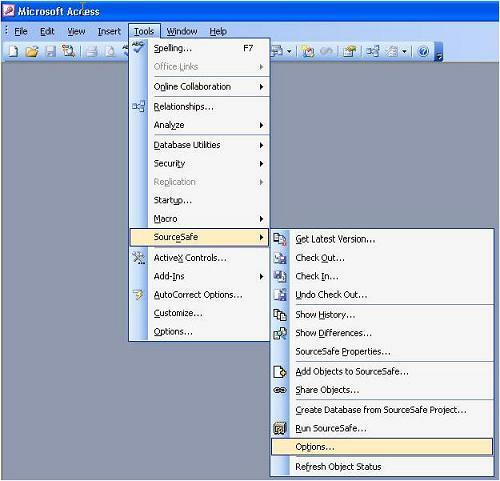 Source Control Tab in Microsoft Access 2010 (download from Microsoft). Visual SourceSafe is only available for the 32 bit version of Access 2010. It is not available for the 64 bit version. 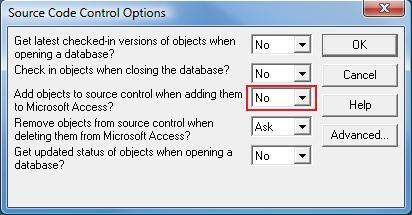 By default, the highlighted option is Yes. Change it to No. This allows you to add new objects to your database while you're developing without a dialog box interrupting you and asking if you want to add it to VSS. Select your new objects and they are added to VSS in one swoop.